I’ve always been a huge fan of BBQ. Heck, I’m the one who convinced my husband and my parents that we needed to drive an hour out of our way when we were in Austin to visit Driftwood, TX so that we could eat at The Salt Lick Bar-B-Que, and boy was it worth every extra mile we drove. My husband, he’s always been more skeptical of BBQ than I’ve been. He likes it well enough, but not always enough to go out of his way just to get some. And to him, BBQ is BBQ, one place or one style just isn’t that much different to him than another place or another style (blasphemous!). 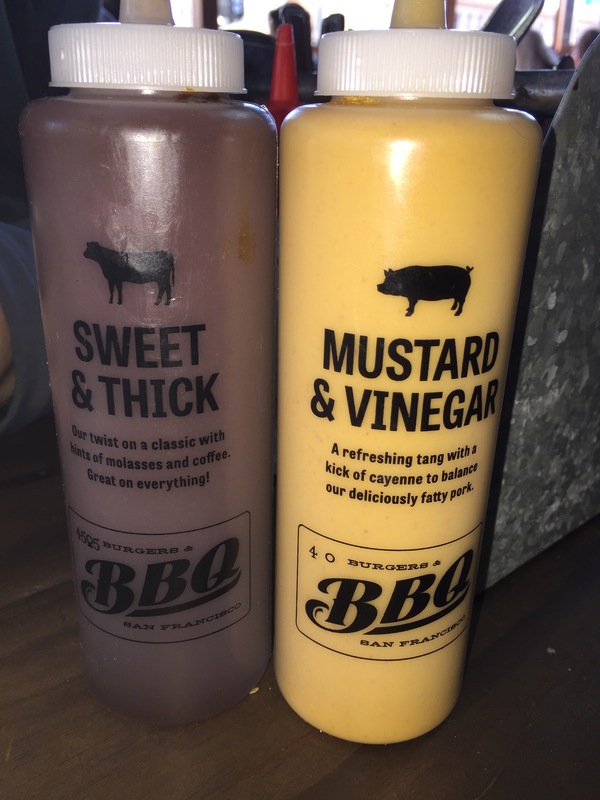 So, when I had read, and seen spots on TV of this new, hip BBQ joint in San Francisco, my husband was really skeptical. But we’d been to San Francisco a couple of times and wanted to try something new and different and this seemed to be outside of your normal San Francisco fare, so he was willing to let me drag him along so we could see what this place was all about. 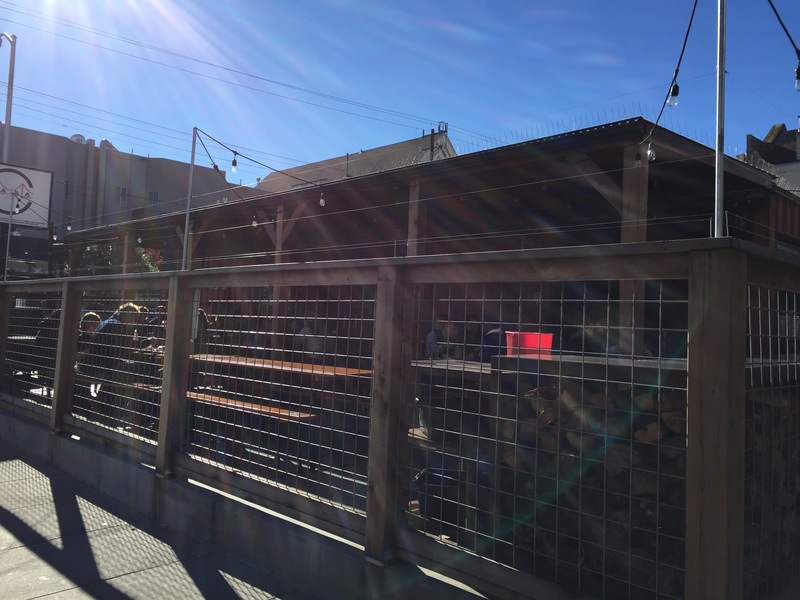 4505 Burgers & BBQ is part of the larger, family-run operation of 4505 Meats which is run by Chef Ryan Farr. Started in January of 2009, 4505 Meats claim to fame was their “lighter-than-air Original Style Chicharrones.” From the success of this product, they branched out and expanded their operations selling their products at farmer’s markets all throughout the city. In 2013, they opened the restaurant 4505 Burgers & BBQ where they sell something known as the “Best Damn Cheeseburgers” as well as 4505 Meats-style bbq. When you walk up upon this funky little joint, you can immediately smell the wonderful aromas of meats that are are smoked on site and it’s hard not to have your mouthwatering by the time you step inside and place your order. Located in a quiet, residential neighborhood of San Francisco off of Divisadero, this would be the last place I’d expect to see a hopping burger and BBQ joint. Even with a corner location, it was hard to even find 4505 Burgers & BBQ until we were almost standing right in front of it and our noses were telling us we were right there. The set up here is simple, there’s an indoor prep kitchen and grill that you step into to place your order at the front counter. Outside, there’s an outdoor smoker and then right on the corner is seating for the joint. The seating is essentially an outdoor, semi-covered patio. All seating is on a first-come, first-serve basis, and you’re requested not to go and take a seat until you’ve already ordered. So, the seating situation could get a little dicey on a busy day as the seating is not that plentiful. There are some smaller private tables, but for the most part, there’s a lot of communal bench-style seating. Luckily, we arrived here on the day after Christmas and they had just opened up for the day, so seating wasn’t a problem for us. The problem was, however, what to order! Once you step inside the restaurant, you’re greeted by a counter with a cash register, and a blackboard behind the counter with the restaurant’s menu. This place is casual enough that you place your order and pay for your meal before you’re handed a number. The number goes on the table outside and when your meal is ready, a staff member will bring your meal to your table for you. At each table are 2 bottles of homemade BBQ sauce that go along with any meal you could have possibly ordered. There’s the sweet & thick BBQ sauce and the mustard & vinegar BBQ sauce. Different flavors for different folks. Oh, when you order, before you take your number and head to your table, you pick up your drinks, which are poured for you at the counter. 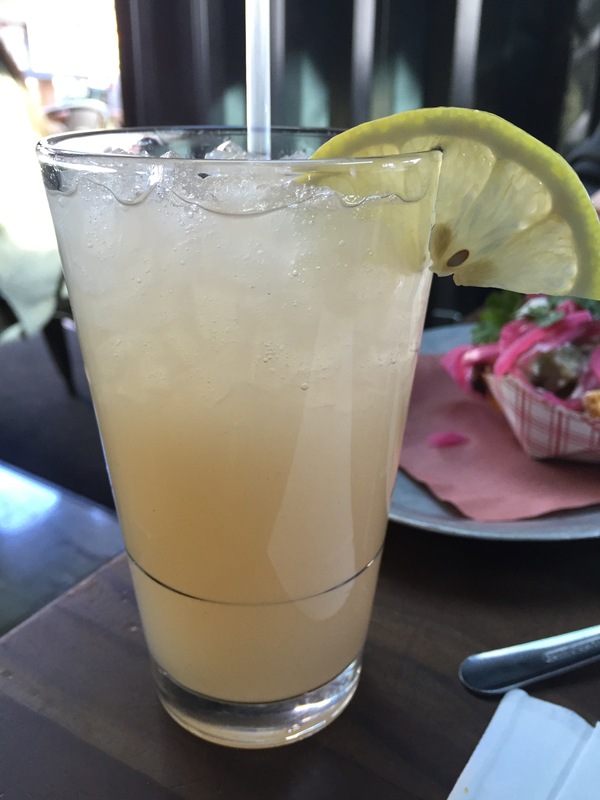 On this nice, beautiful, and slightly warm San Francisco day, I ordered a nice cool, refreshing lemonade. My husband went with the root beer on tap. Delicious, refreshing, and light drinks perfect for outdoor dining. I loved that this felt enjoying a meal at an outdoor neighborhood bbq gathering rather than eating at a fancy-schmancy restaurant. The lemonade was nice and tangy, with a hint of sweetness and the touch of the sliced lemon on the rim of the glass was classy. 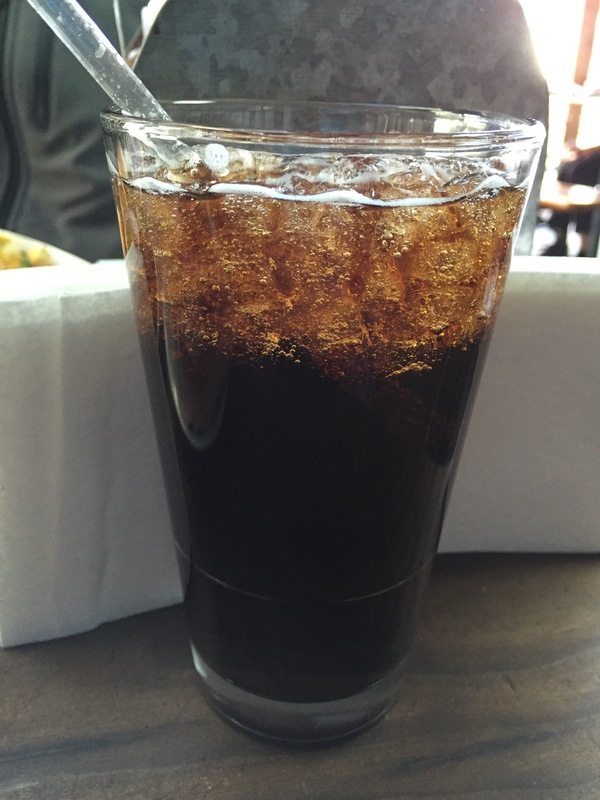 The root beer was refreshing and a little bitter with the hint of cane sugar sweetness. My husband and I, not quite knowing what we wanted, decided to order a couple of items together that we would just share. For my husband, if he’s going to eat BBQ, he’s going to have to eat brisket. BBQ brisket is his favorite type of bbq, so when we saw that there was a special the day we were there for brisket fries, my husband said that we had to place and order for the brisket fries. We had no idea how it was made, or what was on it, because the menu had no description whatsoever, but my husband saw brisket and he saw fries, and he thought that there was no possible way we could go wrong. And he was right. These brisket fries were amazing. 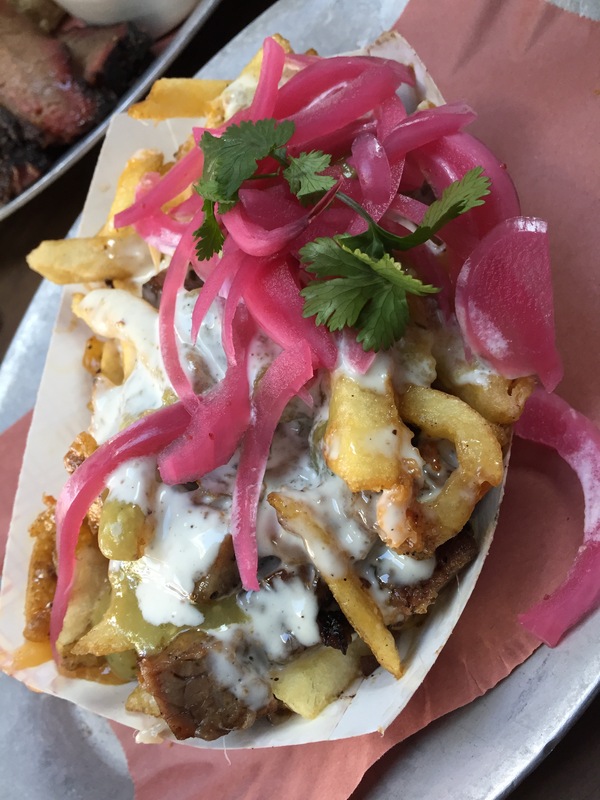 Start out with a tray of well cooked fries, top them with bbq beef brisket, top that with some cheese sauce, pickled red onions and cilantro, and you’ve got some of the most amazing brisket fries. The brisket itself was delicious, and tender and fatty, just the way brisket should be. Combine that with the crunchy and tender fries, the melty cheese sauce, and the tang of the picked onions, and you’ve got such a terrific flavor combination. For my husband, he would have loved these fries no matter how they were prepared. For me, it was the addition of the pickled onions that really put the fries over-the-top. Such a simple, yet, ingenious addition to add to the bounty of flavors found in the dish, it just gave it that extra zing and pop that made these brisket fries amazing. My husband and I also split the 2 meat platter which came with a choice of two side dishes as well. All meat dishes are also served with house-made pickles, Vidalia onions and a parker house roll. For our two meats, as you can probably guess, we ordered more beef brisket as well as pulled pork shoulder. Our two side dishes were potato salad for my husband and baked beans for myself. Let’s start with the side dishes. The baked beans were fantastic, and slightly spicy. I dug into them right away, as I’m a big baked beans fan and if it’s on the menu at a BBQ joint, I will probably order it. The beans were nice and tender without being mushy, which is a plus, but the baked beans sauce had a little bit of a kick to it, which started off delicious before the lingering heat really got to me and started burning my mouth. But again, I’m pretty weak when it comes to spiciness, so I’m sure it wasn’t that hot and spicy. The potato salad side came with two scoops of potato salad sprinkled with some paprika, again just adding a little level of spice and heat. My husband, who is a fan of potato salad, enjoyed the potato salad well enough, but eventually just got so full from the food itself and the fries previously, that he couldn’t finish the potato salad. The meats were delicious and flavorful and super smoky. The brisket, which we already knew was going to be delicious from the chopped brisket in the fries, was absolutely delicious. The first thing that hit us was that it was incredibly smoky. Whatever they are using to smoke the brisket, definitely imparts its flavor right into the beef, and it was fantastic. My husband and I both loved the smoky flavor of the brisket. The beef itself was tender and just pulled apart with the right amount of beef and fat. The pulled pork shoulder was incredibly flavorful and a little spicy. I guess they tend towards the spicier side of things here at 4505 Burgers & BBQ. The pork itself was, again, very tender and there were great chunks of pork rather than just thin shreds, and I like it this way better. Like the brisket, the taste of the smoke really shines through in the pulled pork, and again, my husband and I really liked that. The parker house roll that comes with each meat platter was yummy and buttery, and my husband and I could have done with a dozen rolls rather than just the one. While neither my husband nor I love pickles, I noticed that many other tables were in love with the house-made pickles and even asked for more pickles to accompany their meals. 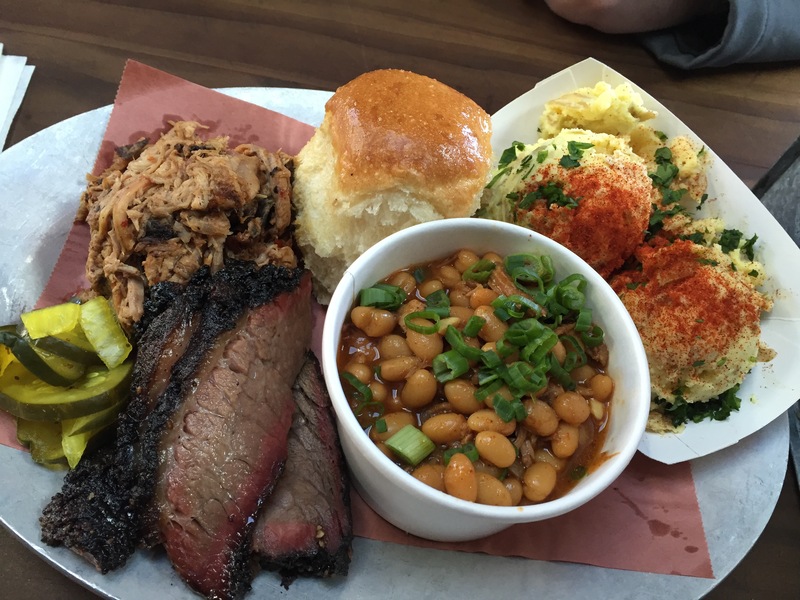 I was so excited to go to 4505 Burgers & BBQ and give their food a try. I think my husband was a little more skeptical and just went along to humor me since he didn’t have a better idea. However, at the end of lunch, we both walked away impressed. The brisket fries we ordered were fun and fantastic and full of flavor. The brisket, in general, was smoky and flavorful and delicious. The atmosphere, the food, and the setting were perfect and relaxed and just what we were looking for on our vacation. We were lucky that the weather was fantastic the day we were there and crowds were non-existent. 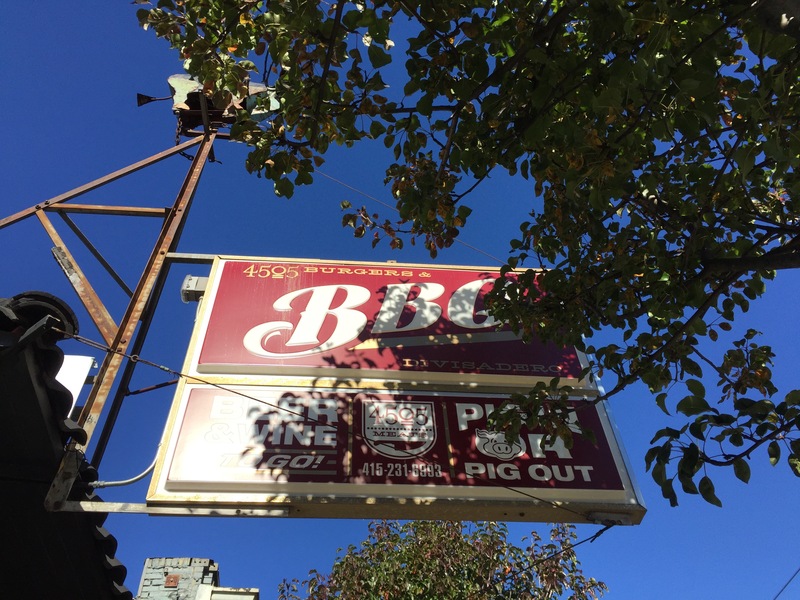 Being able to eat delicious, smoky bbq sitting outside on a patio like we were enjoying a terrific, relaxed backyard bbq in the middle of San Francisco seemed like such a juxtaposition, perhaps that’s part of what makes 4505 Burgers & BBQ as appealing as it is. I would certainly recommend 4505 Burgers & BBQ to anyone looking for something a little different in San Francisco.